So wouldn’t it be cool if we could ask folks on the street what they think caused the obesity crisis, and then show them this and ask them again? Now back to your regularly scheduled blob. Pingback: What’s causing obesity? I can’t believe it’s not butter. This is an exceptional graph. I was wondering if you would mind if I were to use it for an essay regarding ketogenic diet for an A + P class I am doing, I think it would be very enlightening to some of the other students if they choose to read it, the professor as well. Go for it. But I would recommend that you use the original data to make your own graph–your professor will be more impressed that way 😉 Here’s the original data source. The data is on page 5; just add the three categories (overweight, obese, extremely obese) together in a spreadsheet and graph away. 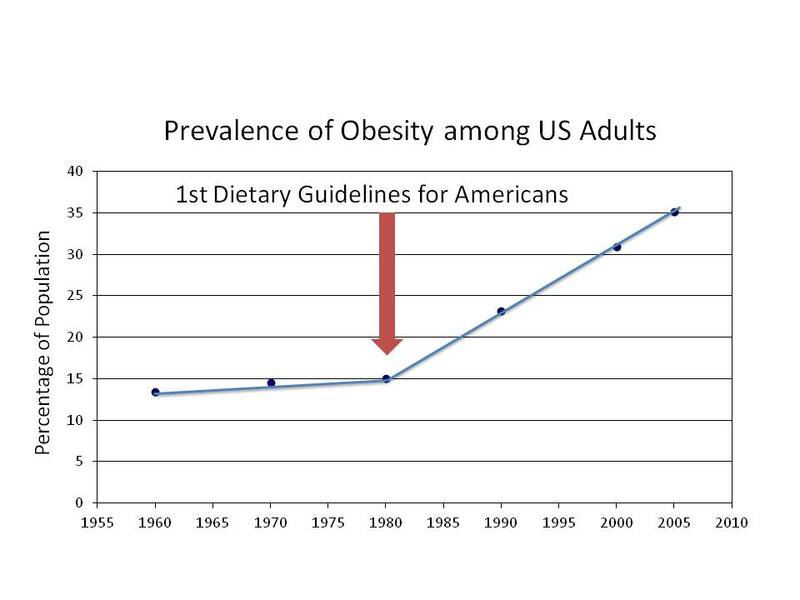 Or use the chart at the bottom of page 3–then add your own “here’s where the Dietary Guidelines were created” point. Let me know if I can be of an additional assistance. Pingback: What’s causing obesity? I can’t believe it’s not butter. | Ancestralize Me! OK, I am still on the edge of my seat. Where is the statistical man? Here he is, as promised. You and Denise Minger would get along…death by food pyramid.